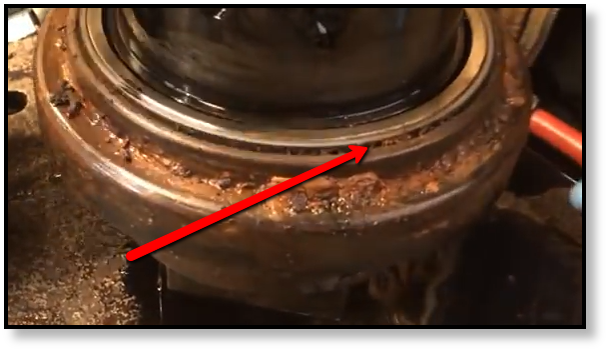 Hydraulic contamination has always been a problem for final drive motors, but this seems to be especially true with newer radial piston motors. Abrasive particles can scratch sensitive surfaces, reduce the effectiveness of bearings, damage gear teeth, scar pistons, drastically reduce efficiency, and more. If the contamination isn’t addressed, it will lead to expensive and irreparable damage not unlike what you see here. However, hydraulic contamination isn’t the only kind of contamination that can damage a final drive. There is also the issue of contamination in the lubrication, namely the gear oil. The results are, or course, going to be bad: useless bearings, scarred up gear teeth, overheating. 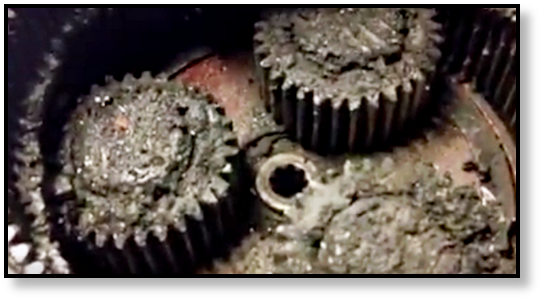 Below is an excellent example of contaminated gear lube. We always hate to open up a final drive and see something like this. Contamination can generally be avoided through the use of clean work practices in the fleet maintenance shop. Clean up around the ports before removing the hydraulic lines, and seal the ports as soon as the lines are removed. Clean up the exterior of the hydraulic motor before opening it up, removing packed in dirt and debris as well as rust. Open up final drive hydraulic motors in a clean work area free of dirt, sand, and grease. Use lint-free cloths and appropriate cleaning compounds on components. If you're replacing your final drive with a second new or reman drive, make sure that you do a system flush before installation. Finally, failed seals are another major source of contamination because if a seal can let fluids leak out, it can let contaminants in. Failed seals should always be replaced as soon as feasible. The case drain line is a low pressure hydraulic line that runs from the final drive motor back to hydraulic fluid reservoir. It carries away internal leakage of hydraulic fluid from the final drive motor, which is to be expected. 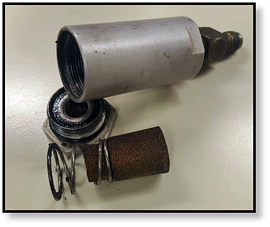 Case drain lines are a common sight on many types of hydraulic machines, including Bobcat SSLs and CTLs -- and a very common source of catastrophic failure for final drive motors when their case drain filters aren't kept clean. The purpose of a case drain filter is to prevent contamination generated inside the hydraulic motor (metal shavings, for example) from reaching the rest of the hydraulic system. That can be very important for the overall health of your equipment. However, if the filter becomes clogged, pressure will continue to build up. Eventually, the seal between the planetary side and hydraulic side will blow, allowing high pressure hydraulic fluid to rush into the planetary hub. Pressure continues to build, sometimes blowing the cover plate off, but always doing major damage. 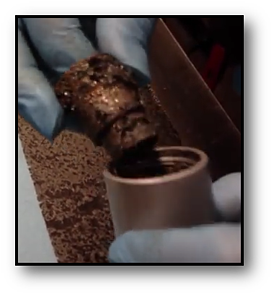 The case drain filter should be checked and replaced as needed, any time the other hydraulic filters are checked. And if you need to replace one - do it! This simple maintenance task can save thousands in repairs, downtime, and replacement costs for your fleet. Seals have a limited life span. When they wear out, they need to be replaced as soon as possible. Not only does a failed seal allow key fluids (including lubricants) to leak out, it allows damaging contaminants, like sand or water, to make their way in. 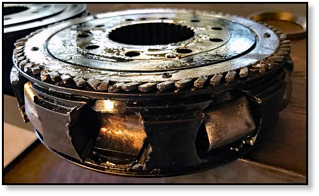 Left unattended, there will be significant fluid loss (which means you could be running gears and bearings with no lubricant at all), severe damage to sensitive surfaces like cam rings and piston shoes, and serious irreparable damage. You will save both time and money in the long run if you get those seals replaced as soon as they begin to show signs of wear. The main sign of wear is going to be leaks, and leaks should never be ignored. Remember that if there is a great deal of fluid leaking out of the hydraulic motor, it is most likely going to be hydraulic fluid leaking from a failed main seal (also known as a duo-cone seal or floating face seal). Small amounts of fluid are usually gear oil from the gear hub on final drive motors. Three major causes of hydraulic motor failure are contamination, clogged case drain filters, and worn out seals. Each of these may seem like a minor issue, but they can quickly domino into a catastrophic failure that renders the hydraulic motor irreparably damaged. 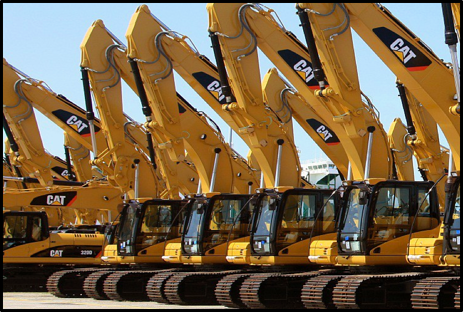 It is very important that fleet managers are aware of these issues and make sure that the appropriate final drive maintenance is performed if they want the machines in their fleet to run smoothly.